The model A2G-85 ventilation duct sensor with an integrated temperature measurement is suitable for direct mounting on circular ventilation pipes or rectangular ventilation ducts. The A2G-85 is a high-quality product solution for ventilation and air-conditioning applications. 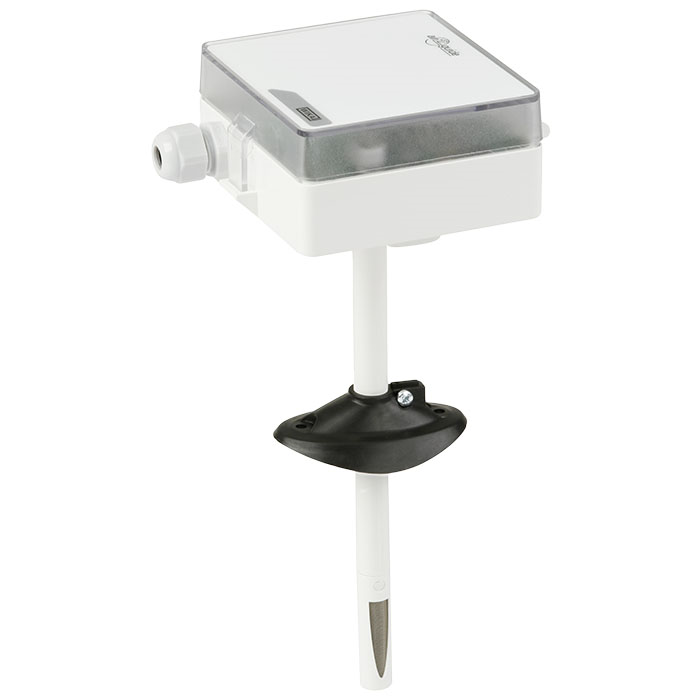 This ventilation duct sensor measures carbon dioxide (CO2) in accordance with the NDIR measuring principle, and in addition also temperature. Due to the combination of these two measurement parameters in one single instrument, the material and mounting cost is considerably reduced. The adjustable mounting flange enables a quick installation. The illuminated display (option) provides good readability, even from a distance. The screwless cover enables fast wiring and commissioning. The measurement of the CO2 content and the air temperature as the basis of demand-orientated control/regulation is gaining ever more importance in the ventilation and air-conditioning industry. The sensor signals for both measurement parameters are transmitted to the control/regulation or building automation with analogue output signals (0 ... 10 V) or digital Modbus® protocol.